You can have up to 6 simultaneous streams on stage at the same time. Each webcam or screen sharing counts as one stream. So it's up to you to decide how you'd like to allocate this 😉 We believe that above 6, it gets really hard to focus on the content. 🚨 Warning: In order to come on stage (to share their webcam/camera), the user needs to be using Chrome, Opera or Firefox on a desktop computer. All they have to do is accept the invite. They will be prompted to configure their audio/video and go on stage afterwards. Bear in mind that, webinar contributors do not have to be invited on stage. They can go on stage themselves by clicking on the green "Go on stage" button found in the webinar room. To remove the guest from the stage, click on the cross at the right corner of the screen. If you want him on stage again, you will have to re-send him an invite. 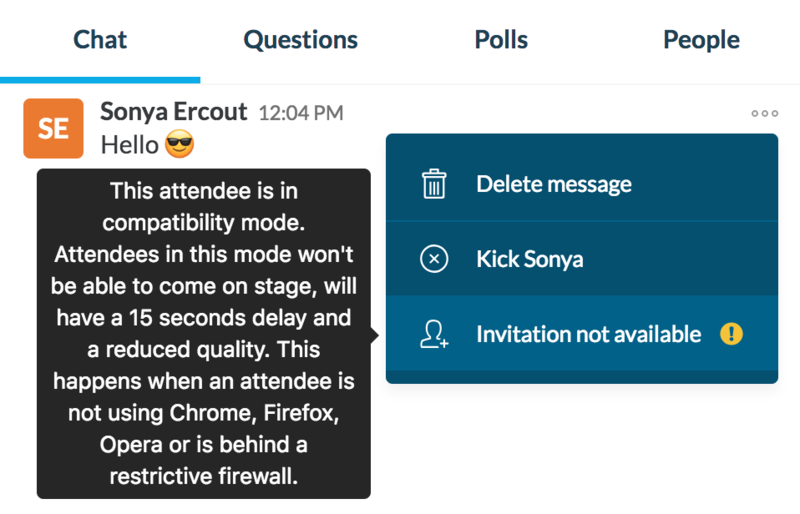 To cancel an invitation on stage, click again on the options button next to the attendee you invited. You will see a "cancel invite" option. Click to cancel the invite. The number of users on stage is limited to 6 at the same time. To accept a new guest on stage someone has to leave first. You can temporarily leave stage by clicking on the cross on the right corner of your screen. You can then come back on stage with the green "Come back on stage" button.